The Discover Nikkei project at the Japanese American National Museum is presenting its latest public program this Saturday, March 28, 2009 from 2-4pm. It will feature a panel discussion with members from four local Kenjinkai groups talking about the role of Kenjinkai now and in the future. For those not familiar with Kenjinkai, they are Japanese prefectural associations. Since the Japanese started coming to America, these groups have played important roles for new immigrants in assimilating into the larger society. 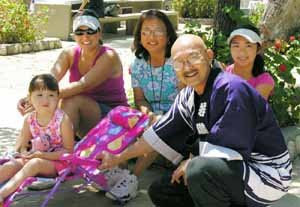 In Southern California, there are 41 existing Kenjinkai groups. Most have gotten a lot smaller in recent years. The children and grandchildren aren't participating as much. Members of Hiroken, Kagoshima Heritage Club, Mie Kenjinkai, and Yamaguchi Kenjinkai will talk about their respective groups and then participate in a discussion moderated by Professor Lane R. Hirabayashi of UCLA to explore what the Kenjinkai mean to younger generations and how they need to evolve in order for these associations to be relevant and continue to exist in the future. The program will also include cultural performances by past Kenjinkai Kyogikai scholarship winners and brief remarks by Consul Hiroshi Furusawa. The program will be followed by a light reception sponsored by Lane R. Hirabayashi, George & Sakaye Aratani Endowed Chair of Japanese American Internment, Redress, and Community, Asian American Studies Department, UCLA. I'm really excited about this program. I think the issues that will be raised are relevant not only for Kenjinkai, but really all Japanese American organizations. The program is free with Museum admission, but space is limited so RSVPs are required.